In our last post, Johntimothy and I had a morning interview/conversation in his studio about printmaking and teaching that we shared with our readers. We turned the tables and Johntimothy interviewed me over lunch at the dining room table about my creative process. Johntimothy: You are always raising the importance of “thinking through your hands.” Can you elaborate on what you see as the significance of that process? Patti: It’s hard to describe, but let me just say that when I try to think about an idea and what it might look like and then go about trying to make that thing….it just never works for me. But when I begin with nothing, letting go and letting my hands move across the page without consciously thinking, then things begin to flow. Often it takes some time for me to understand the internal conversation that is going on, but that’s what it is. It’s like the door to the conscious mind is closed, the “thinking” mind is left outside and the conversation is more below the surface....the murmur you might hear on the other side. Sometimes the result, the finished piece, is such that I still can’t put it into words, as it is beyond words…much deeper. Other times, I can articulate what I couldn’t have before I’d begun drawing. Johntimothy: But you often work with a theme….Notes From The Ancestors, for example. Or you might have an idea about the blood-soaked land. You were reading about things and thinking about them before you made that piece….what was the title? Patti: That piece you are thinking of was Bloodlines and yes, it is a good example of what we’ve been talking about. 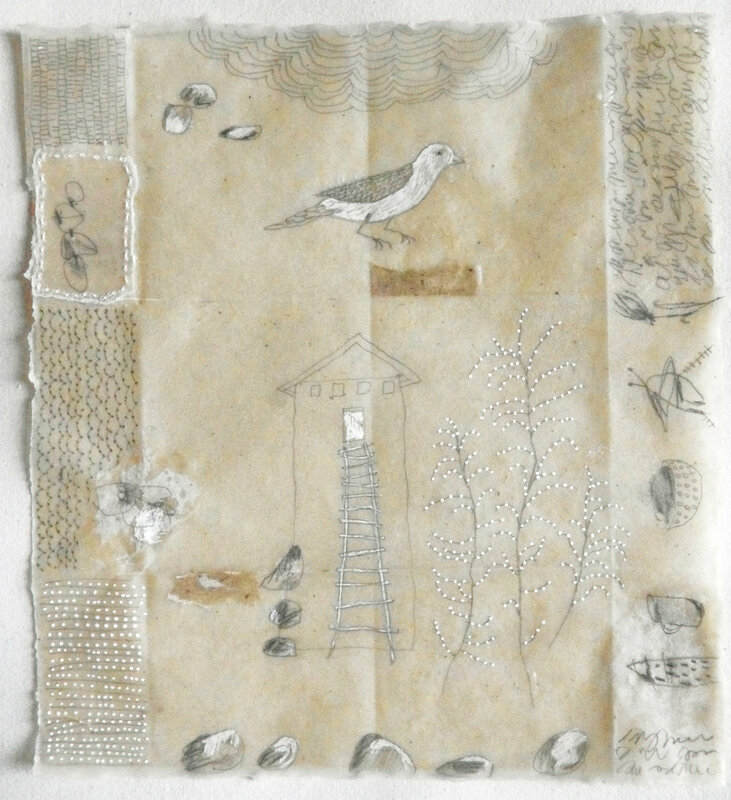 It is an older piece, from a period when I was working on your handmade paper with layers of acrylic and sewing. It was not that long after we moved out here to South Dakota and I was doing a lot of reading about the westward expansion, the displacement of native peoples and the violence…the blood spilled out across the land. The land was literally carrying the memory of what had happened, but I didn’t understand that until I made that piece. I understood that idea slowly, through the many layers of painting and building the surface and then the time consuming stitching. I didn’t set out to talk about or make a piece about that idea. I came to that idea of the blood soaked land holding memory through the making of the piece. Johntimothy: But you have to start somewhere…you choose colors, symbols, marks that end up conveying the ideas. Patti: I don’t choose them exactly. It’s more like an on demand kind of thing….or a just-in-time idea. I “know” what to do at the right time. It starts with play…especially going back to those early mixed media pieces, like Bloodlines. There are many layers in that piece, many layers of red, which I came to understand as blood…and later lots of sewing. Johntimothy: Did you see the sewing, the stitching, as a metaphor for healing? Patti: No, but that is an interesting notion! It was more about another source of layering….I think a lot of the works from that period were a reflection of my understanding of palimpsest and perhaps the land being a metaphor for palimpsest. Recently, I’ve gotten away from the layered painting on handmade paper to the more pared down layering on the Japanese paper, but it is a similar process. It is the same “not knowing” when I start out. Johntimothy: Most of the work you’ve made in the last few years has been on Japanese paper dipped in beeswax. You’re concentrating on a more direct drawing now, rather than using paint. Patti: Yes, like the Notes From the Ancestors series. I found myself thinking about what our collective ancestors say to us about how to live, how best to proceed at this point in time. We are not necessarily good about learning from the past. Each generation seems to have to learn the lessons over and over again. We don’t always listen to the voices from the past and I think there is a kind of arrogance about looking back, learning from history about how to move forward. There seems to be a sort of limitation on how we see what I think of as a continuum of the past, present and future. But all that came after I started to make a couple of those drawings on Japanese paper, which I divided into sections, making drawings in each section that related to one another in some way. In the process, the notion of what I was doing and the title for what was becoming a series, came to me as Notes From The Ancestors. Those drawings and most of those that have followed are dipped in beeswax and then often have sewing, beads or buttons as well. Johntimothy: So, you become conscious about these ideas in the process. You move from not knowing to knowing? Patti: Yes, that is what I mean when I say “I think through my hands.” It is how I come to understand the world or how I think about the world in which I find myself. It is an embodied knowing, just as there is embodied learning. But, we don’t give credit to the whole body. We separate our mind from our body. Why can’t you think through your whole body? What comes out is an expression of what you are thinking, feeling, experiencing. We all internalize the physical world in some fashion, but it is often happening on a subconscious level. Johntimothy: So, your process of making art is your way of excavating that internalization of the world…to get at it, make it visible and then begin to “see anew” and understand. I think I am starting to connect in a deeper sense to your process. So, this very much relates back to the drawing exercises from your early mentor Richard Loveless. You have talked about this exercise on finding your personal mark since we first met. Can you elaborate on how this works? Patti: The exercise relates to what I have come to call meditation drawings. That exercise, given by Loveless in one of my long ago teaching certification courses, was pivotal for me. He described it in terms of an internal landscape of mark making that each person carries within them and the assignment he gave us was a way to discover that idea, as well as the individuality of the drawing marks that we make. It was the beginning of understanding my own internal landscape and learning to trust it, as a vast source of wisdom. Not just my wisdom, but the wisdom of everything that has come before. I realize now, that my daily drawing practice grew out of this exercise. Johntimothy: So how did the exercise work…can you describe the process? Patti: Each person was to start with a stack of 50 sheets of blank photocopy paper and a mark-making tool…pencil, pen, brush, whatever was comfortable. We were to find a quiet and uninterrupted place that allowed us to relax….this was homework, so we were doing this alone in our own at homes. Basically, it was then a process of making marks on each of those 50 sheets without thinking about what we were doing. You were to just let your hand move and “listen” to when to turn the page over and make marks on the second sheet, the third, etc. until you came to the end of the 50 sheets. As I recall, the whole thing took less than half an hour. The idea was never to make “drawings”, but to let go and just work through your body and not think about what you were doing. I remember most folks in the class were art education majors and not studio artists, so many found the process frustrating. I think many of them were not able to let go of trying to make drawings. When we all came back for the next class, Loveless had us lay each of our 50 sheets out in individual groups on the floor in that very large studio. I got it right away. I recognized myself in my own 50 pages. Like looking in a mirror….those marks were my marks and could only have been made by me. It was not about filling the page, but feeling when enough was enough and when to turn the page. So, on one of my pages, for instance, there might have only been one tiny x in the corner. So, it was the weight of the lines in the marks you made, but also where you put things, the spaces, the density of the page. That was a powerful moment for me to recognize myself in the mirror of those fifty pages. I began to really trust my own creative process and I came to believe that we each have an inner landscape of mark making. Getting people connected to such an idea and to trust in it is a whole new conversation. I think our creativity is a fundamental part of natures. Maybe our next conversation will focus on our ideas about creativity and how to help people rediscover that in themselves. Johntimothy: Yes, that's a big one for both of us!